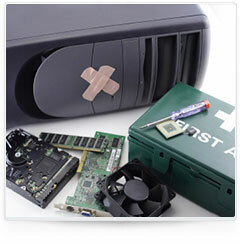 MBC Solutions, LLC offers quick and reliable computer service and repair at a reasonable price. No need to haul your desktop, laptop, or notebook computer to a computer repair shop every time it needs service or repair only to wait a week or more to get it back. MBC Solutions, LLC will come directly to your office or home and solve your computer problem right on the spot. Don’t put your computer repairs in the hands of “Geeks”; let the professionals at MBC Solutions, LLC help you with all your computer repair needs. Simply call us to setup an appointment that fits your schedule. We offer same day, next day, after hours, and weekend service. So before you take a hammer to your computer, let us help you get your system back up and running the way it should.